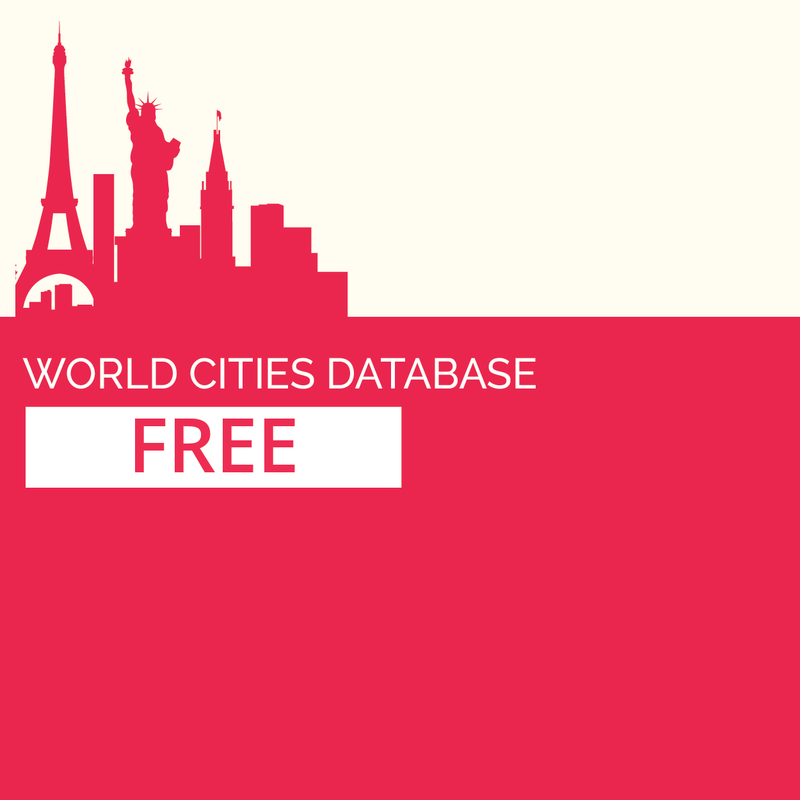 Free database of worldwide cities in text format suitable for any applications requiring a comprehensive list of cities and country code. It is a subset of the paid edition of GeoDataSource World Cities Database Basic, Premium, Gold, Platinum and Titanium Edition. Database of worldwide cities in text format suitable for any applications requiring a comprehensive list of cities name and country code. It is a subset of the GeoDataSource World Cities Database Premium, Gold, Platinum and Titanium Edition. Database of worldwide cities in text format suitable for any applications requiring a comprehensive list of cities name, state/province (ADM1), country code. It is a subset of the GeoDataSource World Cities Database Gold, Platinum and Titanium Edition. Database of worldwide cities in text format suitable for any applications requiring a comprehensive list of cities name, state/province (ADM1), latitude, longitude, country code. It is a subset of the GeoDataSource World Cities Database Platinum and Titanium Edition. Database of worldwide cities in text format suitable for any applications requiring a comprehensive list of cities name, state/province (ADM1), latitude, longitude, country code, population. It is a subset of the GeoDataSource World Cities Database Titanium Edition.